The United States Army Center of Military History (CMH) is a directorate within TRADOC. The Institute of Heraldry remains within the Office of the Administrative Assistant to the Secretary of the Army. The center is responsible for the appropriate use of history and military records throughout the United States Army. Traditionally, this mission has meant recording the official history of the army in both peace and war, while advising the army staff on historical matters. CMH is the flagship organization leading the Army Historical Program. Fort Lesley J. McNair, Washington, D.C., U.S.
CMH is also behind the National Museum of the U.S. Army, which is under construction at Fort Belvoir and projected to open in 2020. The center traces its lineage back to historians under the Secretary of War who compiled the Official Records of the Rebellion, an extensive history of the American Civil War begun in 1874. A similar work on World War I was prepared by the Historical Section of the Army War College. Under the direction of the chief of military history and his principal adviser, the army's chief historian, CMH's staff is involved in some 50 major writing projects. Many of these efforts involve new research that ranges from traditional studies in operational and administrative history to the examination of such areas as procurement, peacekeeping, and the global war on terror. Those works under way and projected are described in the Army Historical Program, an annual report to the Chief of Staff on the Army's historical activities. All center publications are listed in the catalog Publications of the United States Army Center of Military History, which explains how to access them. CMH also serves as a clearinghouse for the oral history programs in the army at all levels of command. It also conducts and preserves its own oral history collections, including those from the Vietnam War, Desert Storm, and the many recent contingency operations. In addition, the center's end-of-tour interviews within the Army Secretariat and Staff provide a basis for its annual histories of the Department of the Army. As tangible representations of the service's mission, military artifacts and art enhance the soldier's understanding of the profession of arms. CMH manages a system of more than 120 army museums and their holdings, encompassing some 450,000 artifacts and 15,000 works of military art. The Center also provides professional museum training, staff assistance visits, teams of combat artists such as those deployed under the Vietnam Combat Artists Program, and general museum support throughout the army. Current projects include the establishment of a National Museum of the United States Army at Fort Belvoir, Virginia, and a complementary Army Heritage and Educational Center at Carlisle Barracks, Pennsylvania. The Chief of Military History is responsible for ensuring the appropriate use of military history in the teaching of strategy, tactics, logistics, and administration. This mission includes a requirement that military leaders at all levels be aware of the value of history in advancing military professionalism. To that end, the center holds a biennial history conference and workshop; publishes Army History, a professional bulletin devoted to informing the larger military history education community; and supplies readings for the army school system, including the ROTC community, and texts and other support for the army's staff ride program. In this effort, the chief of military history is assisted by a historical advisory committee that includes leading academic historians and representatives of the army school system. Staff rides enable military leaders to retrace the course of a battle on the ground, deepening their understanding of the recurring fundamentals of military operations. As one of the army's major teaching devices, staff rides are particularly dependent on a careful knowledge of military history. Center historians lead rides directed by the Secretary of the Army and the Chief of Staff and attended by senior members of the army Staff. It administers the army's Command History Program, to provide historical support to army organizations worldwide. In addition, since the first Persian Gulf War, the center has coordinated the deployment of military history detachments and the collection of historical data during peacekeeping and wartime operations, including those in northern Iraq, Somalia, Haiti, Bosnia, Kosovo, Afghanistan, and Iraq. Fellowships: To encourage and support dissertations in military history by graduate students, the center offers up to four dissertation fellowships each academic year. These fellowships carry a $9,000 stipend and access to the center's facilities and expertise. Although the fellowship program broadly defines the history of war on land, it selects winners with a preference for topics on the history of the U.S. Army. Publications: The Center has over 600 titles in its catalog. It is responsible for writing the official history of the U.S. Army. It is able to facilitate research, provide graphics and editorial support, and carry manuscripts through to publication. The Center also publishes a quarterly history journal, Army History, known from 1983-1988 (No. 1 - No. 12) as The Army Historian. This award-winning magazine currently has a print run of over 10,000 copies and has been in circulation since 1983. CMH's art and documents collections, library, and reference services are available to private researchers. Official priorities permitting, its historians, curators, and archivists advise researchers on military history and stand ready to share their expertise concerning the location of sources. 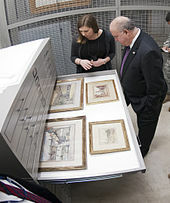 The Collections Branch of the Museum Division arranges temporary loans of paintings and drawings from the Army Art Collection to private organizations that agree to display the art publicly in accordance with Army regulations. The army's museums and historical holdings throughout the country and abroad are generally open to the public, and their curators are available to answer reference questions. As a secured facility, as of 2016[update] requests for an appointment at Fort Lesley J. McNair must be made at least a week in advance. ^ a b "CMH Dissertation Fellowships: General Information". www.history.army.mil. Retrieved 12 January 2016. ^ "U.S. Army Center of Military History Publications Catalog". www.history.army.mil. Retrieved 4 August 2017. ^ "The Army Historian on JSTOR". JSTOR. Retrieved 9 May 2018. ^ "Army History Complete Collection". www.history.army.mil. Retrieved 4 August 2017. ^ a b "Inquiries to CMH". CMH. 1 April 2016. Retrieved 30 September 2016. Gough, Terrence J. "The U.S. Army Center of Military History: A Brief History". United States Department of the Army.